Lately, I find myself shopping more and more at Shop Wiki (SW). It almost seems to be a monthly affair right now, which means SW is doing a terrific job of impressing me with their very comprehensive online shopping site. I enjoy shopping here for it has everything I need. As a shopaholic work-from-home copywriter, who sometimes prefers to shop online rather than going to the mall, I find SW extremely convenient. SW also has the coolest toys for my cats and interesting gadgets for B, but today it's Master's turn to enjoy a little online shopping! I usually drop by SW every few weeks; just to see what's new. And this time around, I was in the mood for new accessories. I need a whole bunch of new ones so I can throw out all the old ones which I hardly use any more. I also need new jeans, shoes, lots of tops and a few cardigans too! 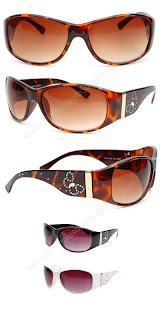 A pair of cool new shades is always on my list as well whenever I enjoy a little online shopping so you can see just how much of shopping I had in mind. Don't you just love these gorgeous Baby Phat stuff I found in the Women Clothing Designer section? And how about these very pretty Baby Phat sandals in Kiwi Green and the delightful butterfly design shades? So when it comes to the latest in Women Fashion Trends; I look no further than Shop Wiki. Browsing through the expansive designer collections available there is sufficient to inspire me to look my best for my next big outing. A reunion is coming up soon so it's time for me to let down my hair and have a little fun with my gal pals. But first, I need to do some shopping; Master needs a whole new wardrobe people! Monica! Meow 1! :) And ur first chop this month, yay! Monica! One PB down but it seems another one is due today huhuhu! Meow! Debbs 2 points edi and it’s only the second day of July, awesome! Pretty right, and of coz I loooooooooove the colour Monica! Oh me too! I bought one new pair of shades in Tokyo but still wan more new ones, so nice la! Not too sound tamak haloba la but seriously wan new shades LOL! Yes sweetie, ur first point this month Jean! how's C, debbs? feeling better already? those r our fav colors Mariuca! Hahahhahahahah exactamundo Mon, our fave colours, surely hard to resist! Yeah 3 more for meows Mon!! I had tandoori just now... :-D u makan edi? Working on another one for meows! I had shrimp burger from wendy’s and otak2! Yum! Pestaim meows posting frenzy LOL! shrimp burger sounds so yum! I love otak2 oso!! haha yalor pestaim! :-D Go meows Go!! Meows moving slowly, but surely LOL! Yeah we bought from the otak2 shop here, very nice. B’s fave! Got one PB for MPG oso, dunno sempat or not! From SS. Must be the one that I reserved, 5 bucks! I like it too but B seems to love this new one we discovered, more than me. He he! Surprising cause this one is spicy, which I shld love! LOL bought 20 today and he ate 10 edi! haha! he bought it at Subang? No here, near my place… from the giant kota d’sara… got wendy’s there too! Yum! I like the giant there, so many nice places to eat! It is and got J Co, Wendy’s, Otak2 House, Chic Rice Shop, a Mexican restaurant and many more! We love the new Giant! Yeah Kenny rogers oso got, the upstairs got more rests…got noodle house…chic bbq rest… he he! MNG still online ni.. yihaa!! Heheheh I letak widget ke LJ? Hahhaha, lemme see now!!!! GADGET la wei! I also like their potato salad, but some branches not so nice! i think maybe the one at the curve only lah not nice! I’ve tried the muffins at the curve but not the chic. Not nice is it? Some more if go rest, sure have to take pics first before eating, B oso fed up edi hahahaha! hahahhah B doesn't like to take pics?? No cause I’ll be snapping many pics, so he has to wait until I’m happy with the pics then only can makan ha ha! Wah so fast, thanks sweetie! Phoebe hug! huh???? how do u know dropped to PR1? OOOOOOOOOOOOOOOPS!!!!! Sorry false alarm!!! MD is still 3 hahahahahhahahahahhaha! Ok back to normal meow mode hahahahhahahahhahahahahahha!!!!! Silly Master!!!! Heheheh sorry Mon!!! That time I was in my post page hahahaha not home page aiyoooooo panic la me!!! I have the plug in where I can see all the Pr and alexa ranking of all blogs surfed, including my own, so can see at the bottom of my screen. Shhhhhh shhhhhh! Mr. G is good he he he!!!! hahhahahhhahahahh!!!!! aiyoooo u scared me lah :-D LOL!!! I scared myself Mon! Rushed out to disturb B watching his sports news with the”bad” news hahahahha, aiyooooooo SILLY BILLY MASTER!!!!!! I can see urs oso! U can install the plugin oso mon if u wan! Hahahahhahahah tu la, happily waiting for him to come inside my office ha ha, then only I’ll tell B LOL! Of coz u are not a loser Ane, HUGS!!! !